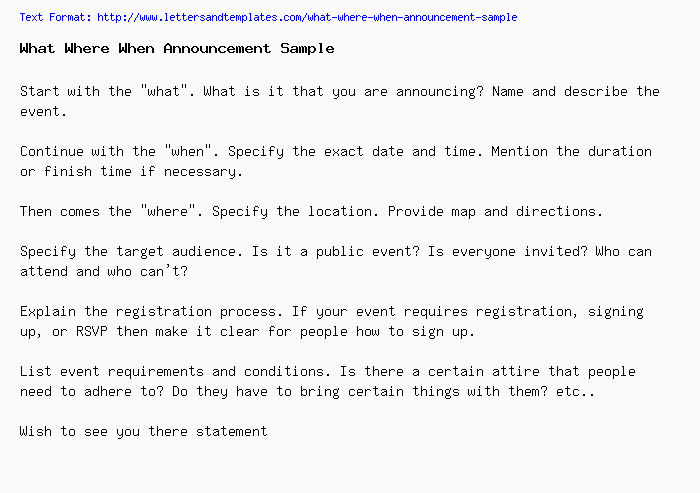 How to write a letter to announce an event? Start with the "what". What is it that you are announcing? Name and describe the event. Continue with the "when". Specify the exact date and time. Mention the duration or finish time if necessary. Then comes the "where". Specify the location. Provide map and directions. Specify the target audience. Is it a public event? Is everyone invited? Who can attend and who can't? Explain the registration process. If your event requires registration, signing up, or RSVP then make it clear for people how to sign up. List event requirements and conditions. Is there a certain attire that people need to adhere to? Do they have to bring certain things with them? etc..
We are happy to invite you to the end of year gala party on the 27th of December at the Ritz Carlton hotel. Seating starts at 7 pm. This event is dedicated only to staff so we apologize for the inability to accommodate family members. Team leads please be prepared to throw a two minutes speech on behalf of your team. Looking forward to seeing all there.